Ninety-eight years after it first went into service, Southend's cliff lift is set to carry passengers once more. The Georgian structure will allow visitors to travel between the seafront and the Clifftown Conservation Area. 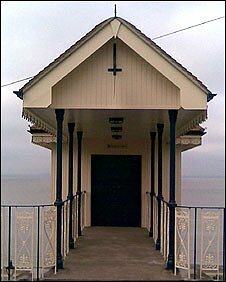 "Our historic cliff lift is a very important part of Southend's heritage," said Southend-on-Sea Borough Councillor Derek Jarvis. The £650,000 refurbishment included the removal of the lift carriage which was then completely refurbished. Work was also carried out on the track the carriage operates on. "The railway it runs on and the track underneath which carries the counter-weight were corroded and had to be reengineered," said Cllr Jarvis. "The stations were refurbished earlier as part of the Heritage Lottery fund granted to the Cliff garden area. "We put the carriage back a few weeks ago. Since then there has been testing on the brakes and motor," he added. 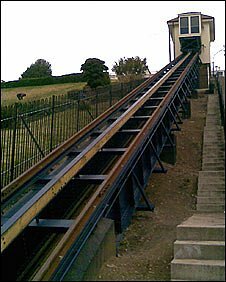 The funicular cliff railway is one of only 26 similar structures in the country. Officially opening the lift was the Mayor of Southend, Councillor Ann Holland. "It is tremendous. It is one of Southend's icons and it has been sorely missed the years it has been closed," she said. During the summer season the lift will operate daily between 10am and 5.45pm. Each trip will cost 50p.